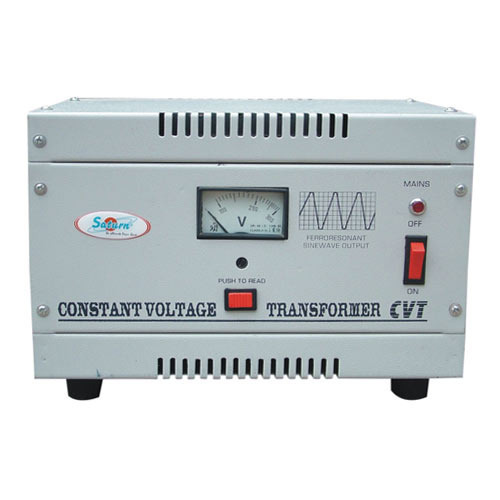 Constant Voltage Transformer is also called voltage regulator. CVT is used in tank circuit specially made of high voltage winding and capacitor to deliver uninterrupted average output with unstable input. The Constant Voltage Transformer suppliers in Chennai offer superior quality design and performance. The CVT is an eye-catcher as it comes with no moving parts and solely relies on loop saturation attributes to draw the conflict in the normal input voltage. There are two sides to the circuit, the primary and secondary. Magnet is implanted in the primary side and the circuit coil is placed in the secondary side. The regulation happens due to the magnetic saturation just over the secondary side. The CVT is a ferroresonant transformer also called ferros. It has excellent surge arrester endowed with high isolation supported by inbuilt protection from short circuit. Both the transformer and the capacitors are consistent and require very low maintenance. It has unique configuration that offer isolation from load equipment. Moreover the device is free from surges and line noise. The product is highly reliable and long lasting supported by warranties. There is a huge demand for CVT in the market and the device can be customized to meet the client needs. The Constant voltage transformer (CVT) comes with a wide range of applications especially where inbuilt and reliable line voltage alterations are of importance. The output is primarily square wave suitable for rectifier output as it comes with a decent circuit attributes. Though, the disadvantage is the regulation and efficiency related to load and frequency. Modern computers come with (Switch-mode power supplies) SMPS equipped to meet brief power interruptions, though it cannot be called a foolproof solution. Even a minor power blackout of as low as milliseconds can cause data loss in the computer. Only a reliable voltage stabilizer provides good stabilization of voltage between 160 to 290 volts. It is applicable to CVT as well. Though, the major disadvantage of voltage stabilizers and SMPS is that it does not stand against unexpected power spikes, power interruptions for a brief period and against dangerous transients. At times such situations can lead to the risk of SMPS being burnt. This could lead to the expensive microprocessor ICs getting damaged. CVT is effective against guarding the output from all types of power issues promising a clean and uninterrupted constant output. It is also designed to fill power gaps of 1-5ms. The output of CVT is pure sine wave under all conditions. How to get superior output voltage using CVT? In the CVT the primary and secondary windings are separated with a broad air gap impacted by magnetic field. This results in a striking decrease of capacitive and inductive loadings. Regular power transients are taken care of by this exclusive design. In between the output voltage and the input voltage there exist phase difference giving rise to superior output sound reduction. The windings in a CVT is isolated the noise is cut off from the high frequency module. Ferroresonance is a phenomenon in the CVT that keeps the balance from any type of variation that occurs in the AC voltage. In this case the secondary output inductor forces to vibrate making use of a greater degree of capacitor performance giving rise to this occurrence. The features stated above indicate that CVT is unique and superior to other type of voltage stabilizers and SMPSs. The CVT allows consistent power output saving the appliances during power surge.